This CellML model describes Model II (NO related reactions) in the published paper, and is able to reproduce figure 3 from the publication. The units have been checked and are consistent. ABSTRACT: Despite the establishment of the important role of nitric oxide (NO) on apoptosis, a molecular-level understanding of the origin of its dichotomous pro- and anti-apoptotic effects has been elusive. We propose a new mathematical model for simulating the effects of nitric oxide (NO) on apoptosis. The new model integrates mitochondria-dependent apoptotic pathways with NO-related reactions, to gain insights into the regulatory effect of the reactive NO species N(2)O(3), non-heme iron nitrosyl species (FeL(n)NO), and peroxynitrite (ONOO(-)). The biochemical pathways of apoptosis coupled with NO-related reactions are described by ordinary differential equations using mass-action kinetics. In the absence of NO, the model predicts either cell survival or apoptosis (a bistable behavior) with shifts in the onset time of apoptotic response depending on the strength of extracellular stimuli. Computations demonstrate that the relative concentrations of anti- and pro-apoptotic reactive NO species, and their interplay with glutathione, determine the net anti- or pro-apoptotic effects at long time points. Interestingly, transient effects on apoptosis are also observed in these simulations, the duration of which may reach up to hours, despite the eventual convergence to an anti-apoptotic state. Our computations point to the importance of precise timing of NO production and external stimulation in determining the eventual pro- or anti-apoptotic role of NO. 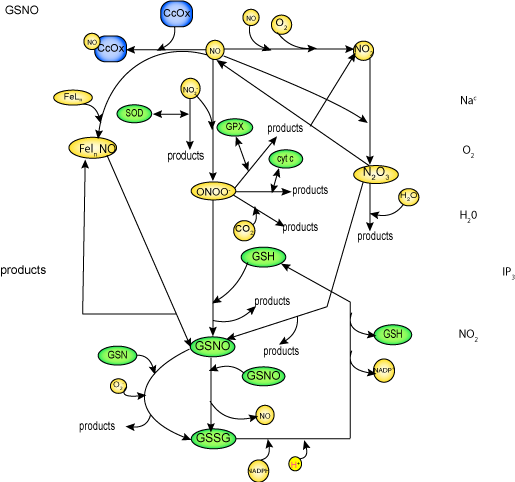 A schematic diagram of biochemical pathways of NO related reactions. Derived from workspace Bagci 2008 at changeset ca2dff72d386.